Galaxies are often thought of as sparkling with stars, but they also contain gas and dust. Now, a team led by UCLA astronomers has used new data to show that stars are responsible for producing dust on galactic scales, a finding consistent with long-standing theory. Dust is important because it is a key component of rocky planets such as Earth. This research is published online in the Astrophysical Journal Letters. Jean Turner, a UCLA professor in the department of astronomy and physics, her graduate student S. Michelle Consiglio, and two other collaborators observed a galaxy roughly 33 million light-years away. 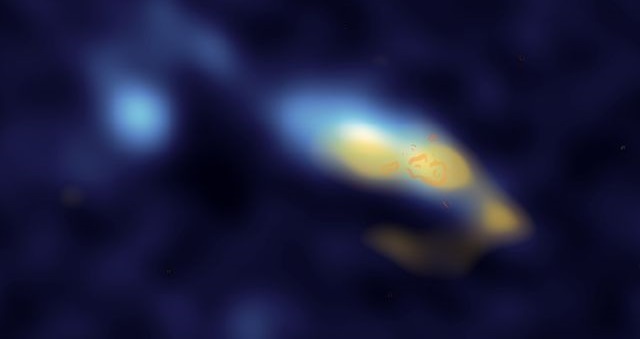 The researchers focused on this galaxy, called “II Zw 40,” because it is vigorously forming stars and therefore useful for testing theories of star formation. “This galaxy has one of the largest star-forming regions in the local universe,” Turner said. The researchers, led by Consiglio, obtained images of II Zw 40 using the Atacama Large Millimeter/submillimeter Array telescope. This telescope, located in Chile’s Atacama desert, is composed of an array of 66 individual telescopes that function as a single large observatory. In 2011, Turner took a three-month sabbatical from UCLA to help prepare the Atacama Array to be used by the astronomical community. “I helped with reducing data and served as astronomer on duty,” she said. The telescope is sensitive to light in the millimeter and submillimeter part of the electromagnetic spectrum, just slightly shorter than microwaves. Capturing this kind of light requires a telescope at high altitudes — this one is built on a plateau at 16,400 feet — because “the Earth’s atmosphere is beginning to absorb very strongly at those wavelengths,” Turner said. “All ALMA scientists work at a lower elevation because you can’t think well at that altitude,” she added. Consiglio and her team observed the central region of II Zw 40, a part of the galaxy with two young clusters of stars, each containing roughly a million stars. By imaging II Zw 40’s star clusters at different wavelengths, they constructed a map that traced the dust in the galaxy. Astronomical dust — made mostly of carbon, silicon and oxygen — is prevalent in the universe. “If you look at the Milky Way in the sky, it looks kind of patchy and splotchy. That’s due to dust blocking the light,” Turner said. The researchers tested whether the location of the galaxy’s dust was consistent with the location of the galaxy’s star clusters. They found that it was: Consiglio and her team showed that II Zw 40’s dust was concentrated within roughly 320 light-years of the star clusters. “The dust is all focused near the double cluster,” Turner said. This observation supported their hypothesis that stars are responsible for producing dust. “The double cluster is a ‘soot factory’ polluting its local environment,” Consiglio said. The researchers propose that the dust enrichment is so obvious in II Zw 40’s star clusters because they contain large numbers of very young, massive stars, which are the producers of dust. “The evolutionary time scales of these stars are short enough that you see the dust before it has a chance to get dispersed very far from its source,” Turner said. “We’re looking at the best place to see dust enrichment, in large star clusters,” Consiglio added.